The Science Behind Tornadoes « Adafruit Industries – Makers, hackers, artists, designers and engineers! The most intense tornadoes spawn from supercells, massive thunderstorms with rotating hearts called mesocyclones. For a supercell to form, the skies “need the ingredients for a regular thunderstorm,” says Harold Brooks, a research meteorologist with the National Oceanic and Atmospheric Administration‘s (NOAA) National Severe Storms Laboratory (NSSL) in Norman, Oklahoma. Those ingredients include warm moisture near the surface and relatively cold, dry air above. 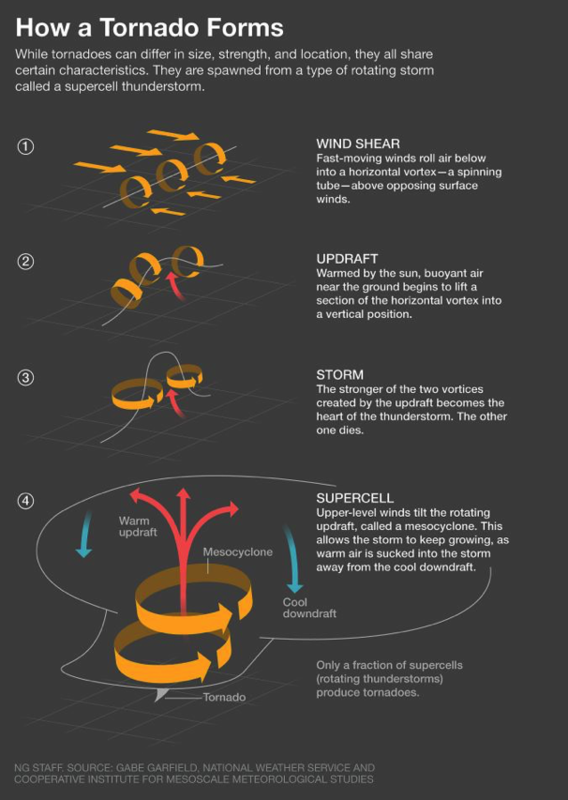 But supercells require winds that increase in strength and change direction with height, generating horizontal tubes of rotating air parallel to the earth’s surface.